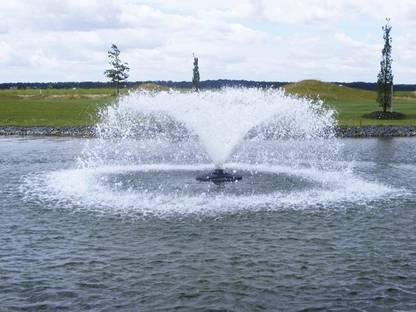 Floating fountains are the most reliable and easy to maintain fountain for large ponds or lakes. 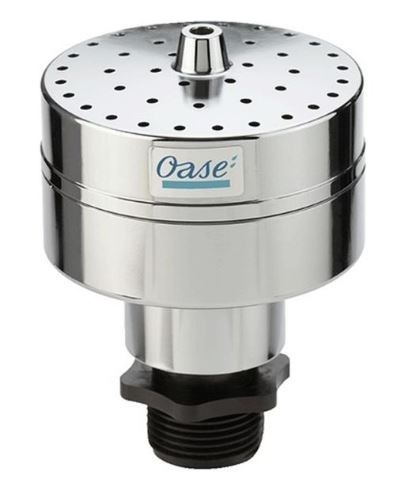 Our range of Oase floating are the definitive answer for anyone who wants a truly impressive fountain which is also made to the highest standards and workmanship. Floating fountains stay on the surface without tipping, thanks to robust float elements. The foamed float element ensures ideal buoyancy of the floating fountains. Only the nozzle and the surface of the float element are visible; the technology remains concealed underwater. A range of various interchangeable nozzles are available for different fountain effects as well as different fountain height sprays. LED light sets give the fountains a fascinating appearance in the evening hours. Floating fountains are unaffected by changing water depths and can be pulled to side of your lake or pond for easy cleaning. As well as that there are a range of different nozzle types to choose from so your fountain display can be changed and varied as required. Water in its most beautiful form – fountains are not only an attractive highlight for any body of water, they enrich the oxygen levels in the body of water; a contribution toward the reduction of algae.